Chutes and Ladders is a popular children’s board game. In some ares, it is known as Snakes and Ladders. The board is divided into ten rows of ten squares each and the squares are numbered from 1-100. 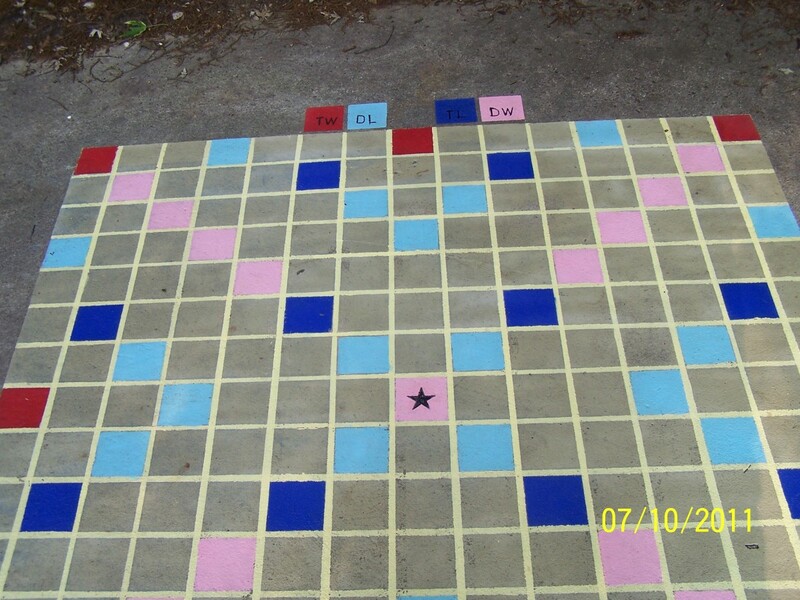 The board contains an equal number of chutes and ladders that each span across several rows of the board. To begin the game, players’ place a token on the square marked 1, which is usually located in the bottom left corner. On their turn, each player rolls a single die and move the number of squares indicated. Players move to the right across the bottom row, then to the left across the second row, the right across the third row and so on. The goal is to land on the 100th square. Players must roll the exact number to reach the final square. Landing on the square at the bottom of a ladder permits the player to climb the ladder, which allows them to skip several spaces and gets them closer to their goal. If a person lands on the square at the top of a chute, they have to slide down to the bottom of the chute, which can be a considerable setback. If a person rolls a six, they can immediately take another turn. The popular phrase “back to square one” was heavily influenced by the game of snakes and ladders. Some argue it even originated with the game. 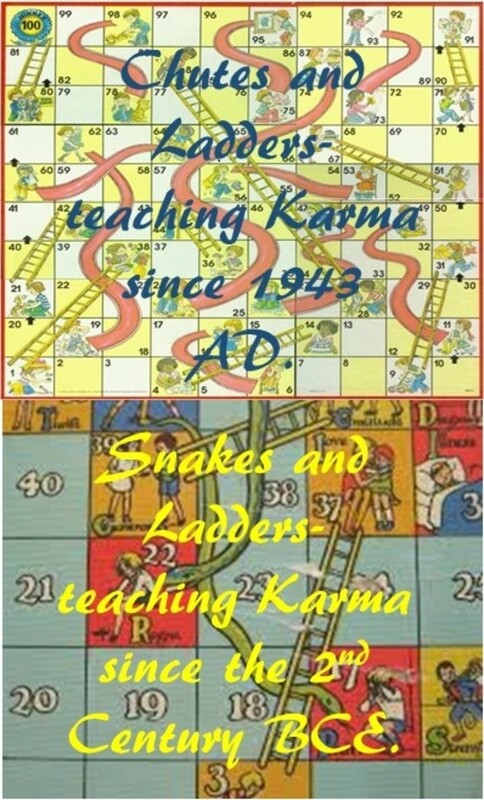 The original point behind the game Snakes and Ladders, the predecessor of Chutes and Ladders was to teach children the concept of Karma. Chutes and Ladders originated as an Indian game. The game was originally known as Mokshapat or Moksha Patamu. Its original inventor is unknown, but it is believed to have been played as early as the 2nd century BCE. Instead of the chutes iconic to today’s popular game, the original game featured snakes and ladders. And, instead of housing an equal number of snakes and ladders like today’s game board, the board housed more snakes than ladders. The snakes represented the evil in the world and the ladders represented virtue. According to Hindu beliefs, the sum total of a soul’s existence in this life will dictate the form in which they are next reincarnated as. Virtuous deeds will result in a pleasant life and a pleasant body and evil will be rewarded with unpleasantries. This idea is known as karma. The ultimate goal is to reach perfection and become free of the cycle of reincarnation. Becoming free of reincarnation and entering nirvana or a state of spiritual enlightenment and perfection which is free of worldly cares is known as Moksha. This is represented on the game board as reaching the 100th square. Just as landing on a snakes head and encountering a setback puts you farther away from reaching the 100th square, evil deeds caused suffering and made it harder to reach enlightenment and Nirvana. The opposite, represented by the ladders, was also true. Good virtuous deeds and conduct brought someone closer to Moksha. Snakes and Ladders was produced in Victorian England in 1892. It eventually made its way to the United States, where it was redesigned and renamed Chutes and Ladders by Milton Bradley in 1943. 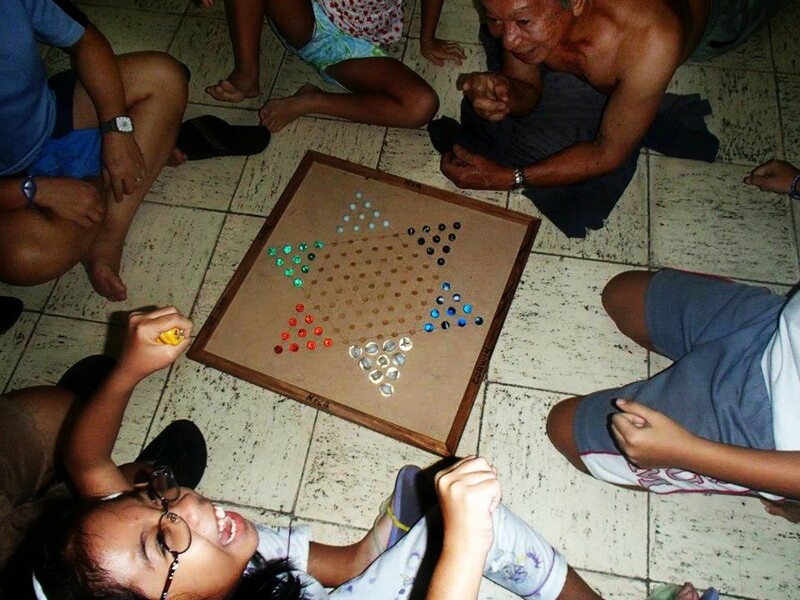 At that time, players advanced their pieces according to a spinner, instead of rolling a die. The 10” by 10” board was decorated with playground equipment. Squares at the top of a chute showed a child doing a mischievous or foolish act and squares at the bottom of the chute depicted a child suffering the consequences. On the other hand, squares at the bottom of the ladders depicted a child doing a good or sensible thing and squares at the top of the ladder showed the child being rewarded. Black children were first depicted in 1974 in the Milton Bradley game. It has since been re-released with a number of themes, including Sesame Street characters and Dora the Explorer. 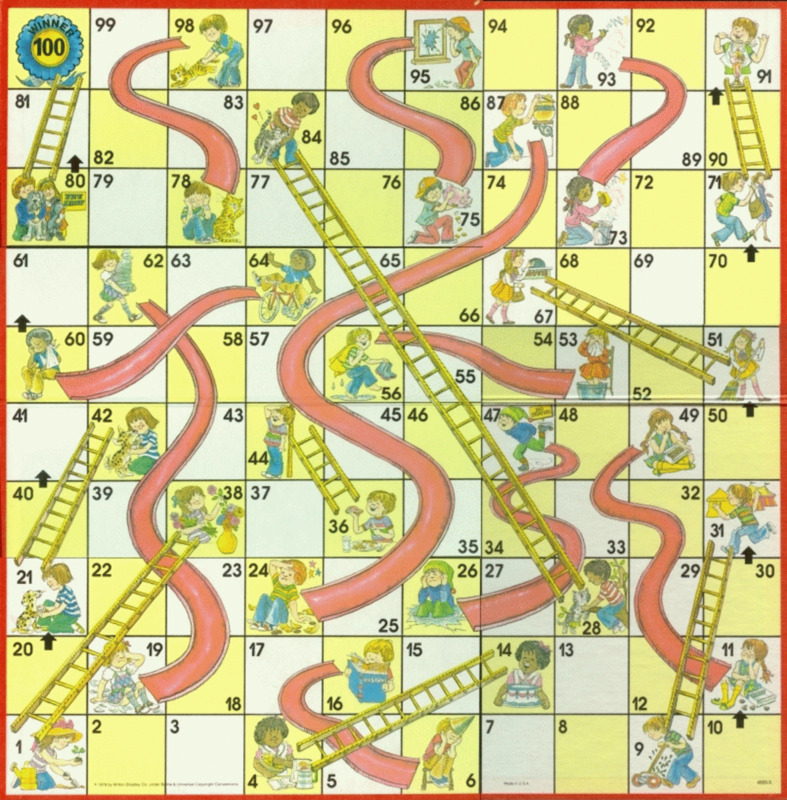 In Canada, the game was traditionally sold by the Canada Games Company as “Snakes and Ladders.” However, with the end of the Canada Games Company, the Chutes and Ladders game, still produced by the Milton Bradley Game Company, although now owned by Hasbro, has gained popularity. 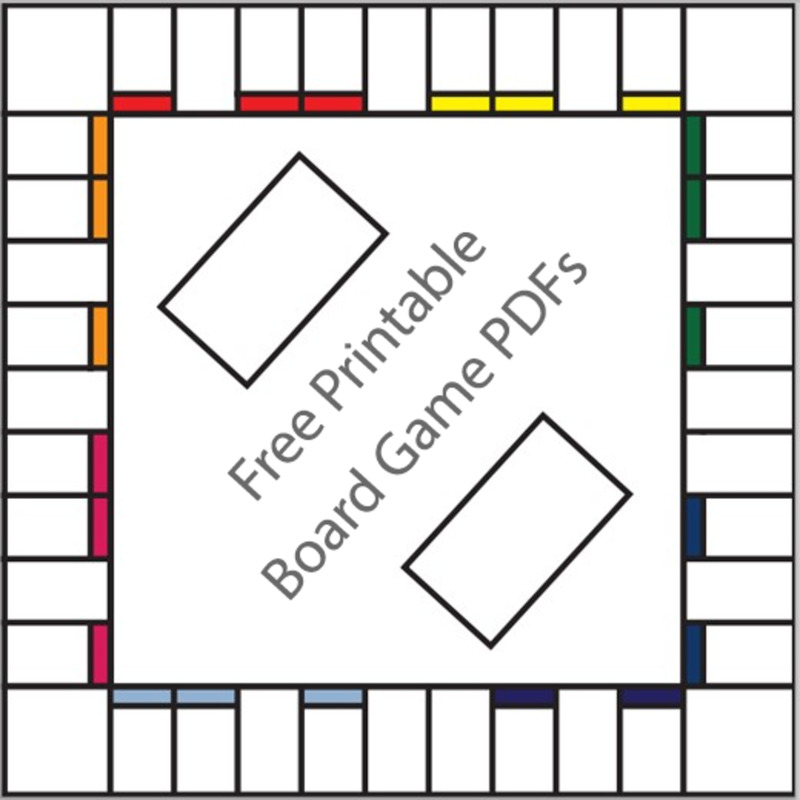 A fun analysis of the statistics behind playing Chutes and Ladders is available here. @Larry_Rankin and @AliciaC I'm glad you enjoyed it! I too loved this game as a child and didn't know the history until I was an adult. It's a pity it isn't more commonly known! PS@Larry_Rankin, sorry it took me so long to respond! I'm not sure how I missed responding to your comment for so long! I grew up in the UK and loved playing snakes and ladders as a child. Thank you for sharing the interesting history of the game. I had no idea that the game started in India! I always enjoyed this game as a child. I never realized there was such a rich history behind it.